It’s been weeks, more than a month, since this conversation happened. But I can’t shake it. Straight to the core, she knows me, she gets me. I’m sorry she had to pay probably $75ish for me to learn this lesson, but it might have been worth every dollar to the camera gods. I need to budget for speeding tickets in my life. I want to know the answer to every theological question right now. I want everything to make sense right now. I want to check off all the boxes right now and know what it feels like right now to get there, to do that, to be that person. This isn’t a new thing. I’ve always done it. I hate the waiting game. When I was 15, I remember dazing off in class, dreaming of the day I could drive a car. The day I had my license, my life would be complete. Well, that day came. I passed the test (with a woman who only let me pass because I told her I was late to dance class and she had a hidden passion for tap dancing) and I got my license, bought a car, then another car, then another car. And the itch remains. I thought I would have the keys to the world? I thought I would be in control, I could go wherever I wanted, I could feel like a real adult? I even did the whole Jesus take the wheel thing. But the cameras are still flashing. I’m still stuck in those speeding traps, ten steps ahead, sick and tired of being sick and tired from all the waiting. I’m probably writing these words more for myself than for anyone else. 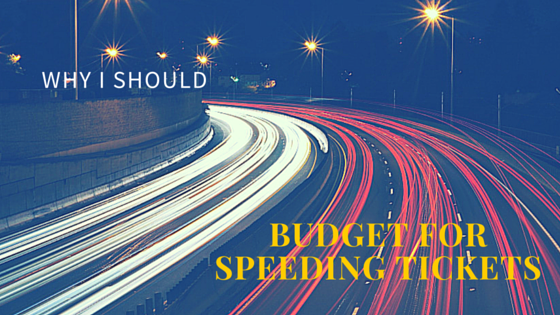 I need to look back and remember that I need to budget for speeding tickets. Excuse me, young lady, but is there a reason that you’re going so fast? Well, Officer, you see…I’m kind of in a hurry. I’ve got these plans, these dreams, these visions of the person I want to be and I’m tired of waiting. My time here might be limited, so I just need to get there now. Yesterday. I’m late. You see, from the time I was a little girl, I sat on the typewriter and wrote stories about my family at our lake house. Chapter 1: My Family at The Big Lake. My people ate this stuff up, told me I was talented. My grandma would ask what I was doing and I would say, “Busy, busy, busy!” They told me that I was a writer, that I had stories to tell, and people to reach. They told me that people would listen, people needed to hear these stories. They told me that one day I would walk into Barnes & Noble, inhale the glorious smell of new books, and there on the shelf would be my book. By Ashley Tieperman. Forget the windy side streets to get there, forget the giving thanks at first base and second base and third base. I want to slam a home run and have the crowd jump to their feet as it soars out of the park. I want to celebrate with my team and hear them yell, “You did it!” as they carry me on their shoulders for the crowds to see. But for now, this game is quiet and isolating. I have big stories to tell about dark moments of waiting. Waiting in waiting rooms, waiting for prayers to be answered, waiting for the pain to fade, waiting for test results, waiting for permission to live, waiting for reasons for joy, waiting for Jesus to turn five small barley loaves and two small fish into a feast for five thousand when it seemed humanely impossible. I will budget for these speeding tickets. I will pull off the highway and take the windy back roads. I will give thanks for the quiet, one-lane roads that wind and bend and slow me down. One day I know I will wish for the quiet roads. I will realize when I’m going too fast and I will stop on each base and give thanks. I will hear my teammates cheering me on to each new base. You’re doing it! If I try to steal a base and get sent back, I will listen to them say It’s ok, it’s ok. I will slide into each base if I have to. I will roll in the dirt and get skid marks on my white pants. I will stop myself before I even think about taking time to make sense of these messy metaphors, flipping back and forth between speeding in a car and playing baseball. Because that’s not the point. The point is that this journey is messy and I need to budget in my time calculator to make space to realize I’m going too fast, trying to jump ahead to days unknown. These aren’t the metaphors that matter. The only metaphor that matters is this: I will believe that I will make it home. Recently, I was telling someone about living in the future…..about always planning for the future, instead of BEING, LIVING in the present…in the, ‘now’. “One-day-at-a -time” (which in the past sounded like phooey to me) is now starting to make perfect sense. …so is it about ‘Control’? That being, Not, ‘Controlling others’ lives’… rather, being able to control your own life? Hey UB! Yes, it is all about Control (with a definite capital C). Don’t we all want to be in total Control over everything right now? Thanks for joining the fight with me for one-day-at-a-time. so relatable, thanks for sharing! many blessings on your journey. i too am young with a chronic illness. Hi Ina! Thanks so much for being here. Praying for you and your health journey.